Drugs as Weapons Against Us is a virtual encyclopedia of the global drug trade. Author John L Potash devotes special attention to the long involvement of the British and US government in illegal trafficking – for the political and financial benefit of the elite families who control these governments. 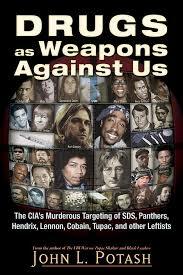 Most of the book focuses on MKUltra, the top secret CIA program devoted to developing and experimenting with mind altering drugs such as LSD, MDA (an ecstasy precursor), STP, PCP and scopolamine. Although CIA Director Richard Helms ordered all MK-Ultra records destroyed in the mid-seventies, 30,000 pages of documents were preserved in the CIA Finance Department. Meticulously researched and footnoted, Drugs as Weapons relies on an extensive variety of sources, including the 30,000 pages, FOIA releases, police files, whistleblower statements, media and alternative media investigations and other prominent researchers such as Peter Dale Scott, Alfred, McCoy, Alex Constantine, Catherine Austin Fitts, and the late Gary Webb and Michael Rupert. I was particularly horrified to learn about the LSD distribution network MKUltra agents set up in the Haight Ashbury to lure Berkeley students away from the nationally influential Free Speech movement. The latter, originally formed in 1957 to protest the anti-democratic activities of Senator Joseph McCarthy’s House on Un-American Activities Committee, went on to inspire the national anti-Vietnam War Movement. In addition to various MKUltra scientists and agents, the CIA also relied on a number of high profile personalities – LSD guru Timothy Leary (an admitted CIA asset), author Ken Kesey (One Flew Over the Cuckoo’s Nest), and Grateful Dead band members – to promote and distribute LSD as an alternative to organizing against the Vietnam War. Potash begins his book with important historical background on the origins of the global drug trade, which he traces back to 1500 and which European elites relied on heavily to finance imperial expansion and colonization. He also recounts the history of important Wall Street families – the Cabots, Cushings, Bushes, Astors, Russells, Pierponts (JP Morgan’s family) – who all owe their immense wealth to the opium trade the British involuntarily forced on China via the Opium Wars. The investment of these families in illegal drug trafficking continues to the present day, as evidenced by the involvement of all major US banks in multibillion dollar drug money laundering. The Russell family, who would go on to found Yale and the Skull and Bones Society, openly used a skull and bones pirate flag on their opium trading ships. Potash also carefully details the special relationship between these Wall Street families and the intelligence agency they founded during World War II (the OSS, which became the CIA in 1947) to protect their special interests. This comes out really clearly in the chapter in which Potash traces the origins of the Vietnam War. He makes a really strong case that this war (which began in the late fifties as a CIA intervention) stemmed directly from CIA determination to protect Golden Triangle opium production from efforts by nationalist leaders in Laos, Thailand and Vietnam to eradicate it. One of Mao’s first acts after winning control of China was to destroy the country’s vast opium network. With the support of the CIA, the nationalist Chinese generals who had controlled it moved their networks into Burma, Laos and Thailand. In a similar vein, the CIA assisted Klaus Barbie and other Nazi war criminals it smuggled out of Germany in setting up a cocaine production and distribution network in Colombia and later the Afghan Mujaheddin in turning their country into the world’s largest producer of heroin. Potash makes a compelling case that the proximate cause for the US invasion and occupation of Afghanistan in October 2001 was the Taliban’s successful eradication of opium production earlier that year. Richard Wright – African American writer involuntarily dosed with LSD who later died under extremely suspicious circumstances. Elvis Presley – became addicted to amphetamines and narcotics after covert intelligence officer became his manager. Mama Cass Elliott – died under mysterious circumstances at age 32 after starting to date an international drug smuggler with suspected intelligence links. Abbie Hoffman –introduced to LSD by roommate who worked for Army Intelligence research LSD effects on unconsenting GIs. Mick Jagger – involuntarily dosed with LSD and subject to numerous drug frame-ups and two unsuccessful Hell’s Angels (working closely with US intelligence) assassination attempts. Brian Jones – subject to numerous drug frame-ups and intense phone harassment and stalking prior to 1969 murder (which police covered up as “accidental” drowning). Jimi Hendrix – intelligence-linked manager strongly implicated in death related to involuntary drugging. Janis Joplin – introduced to amphetamines and heroine via intelligence-linked boyfriend, died after “friend” slipped her a bolus of pure CIA heroin. John Lennon – involuntarily dosed with LSD and framed on bogus cannabis charge. Lennon’s alleged assassin Mark Chapman had strong intelligence links and appeared to be under influence of scopolamine. Bob Marley – involuntarily injected with the cancer-causing chemical methlychoanthine (via a copper wire hidden in boots gifted to him by CIA asset Carl Colby) and subsequently died of fibrosarcoma. Kurt Cobain – involved in heavy drug use by his wife Courtney Love, who had shadowy underworld and intelligence connections. Cobain allegedly shot himself in the head with a shotgun after consuming so much heroin he would have lost consciousness before he could pull the trigger. Tupac Shakur – multiple assassination attempts and police frame ups. Coerced, as part of a bail agreement, into signing with Death Row records (see The FBI War on Rap). The latter was run by Los Angeles police intelligence unit and heavily involved in drug and gun trafficking. Killed in drive-by shooting instigated by US intelligence. Eminem – initiated into heavy drug use via undercover intelligence “friends” after helping Afeni Shakur (following Tupac’s assassination) to record many of Tupac’s songs.